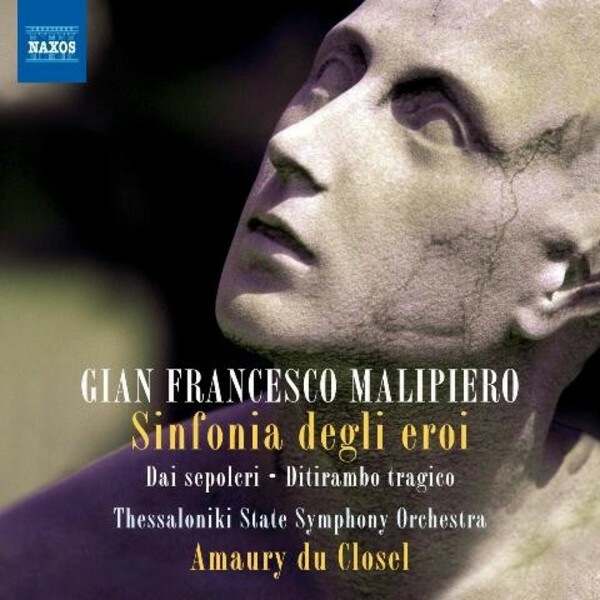 Five vividly contrasting works, four of them in world première recordings, make up this latest issue in the Naxos series of orchestral music by the Italian composer Gian Francesco Malipiero. Visions of heroism and death form the cornerstone of the release, in the Ditirambo tragico (Tragic Dithyramb) composed during the First World War, and in Malipiero’s two earliest surviving pieces, Dai sepolcri (From ‘Tombs’) and the Sinfonia degli eroi (Symphony of Heroes). They are heard alongside the deceptively relaxed charm of Armenia, based on traditional Armenian melodies, and the varied, pungently Stravinskian moods of the aptly titled Grottesco (Grotesque). The Sinfonia degli eroi (Symphony of Heroes) is the earliest of the seventeen pieces Malipiero called ‘Symphony’, and the only one that has never previously been recorded.